Group 2 Created with Sketch. Group 12 Created with Sketch. We are a family filled with hope and compassion. We are The Uncomplicated Family, a progressive and passionate health company. We embrace commitment, innovation and compassion to enhance the quality of life for individuals, families and communities who are affected by disabilities. Our teams include: Speech-Language Pathologists, Occupational Therapists, Physiotherapists, Family Support Personnel, Software Developers and Engineers, Researchers, Psychologists and more. "We are dedicated to providing the highest standards of clinical, educational and family support to children and families with special needs and those who are at risk." The Uncomplicated Family Corporate Group includes Kids Uncomplicated Inc. (Clinical and Family Support Services) and Communities Uncomplicated Inc. (Software Development: Teleroo™ Technology). Communities Uncomplicated builds revolutionary collaboration software tools, therapy support apps, and mobile accessible games, collectively called Teleroo™. Kids Uncomplicated is an international organization of passionate people who embrace commitment, innovation and compassion to enhance the quality of life for individuals, families and communities. "We are committed to leading the charge to create a profound, positive social impact for our children, families, and the community at large." Navigating systems to find the right supports can be stressful. We take that to heart. First and foremost, our commitment is to listen and learn about your unique family. We then individualize supports and use our technology tools to ease the high demands of your everyday life. We believe strongly in connecting families to the natural support systems in their communities. Our teams are committed to supporting you in enhancing your confidence, facilitating access to information, and ultimately empowering you to achieve your vision for your child and family. We celebrate the unique strengths of each child, family and community. Skills that facilitate language comprehension, interaction, and communication with others. The skills required to control movement of the body. Coping and skill development required for completing routine everyday tasks and activities. Supports and strategies needed to cope with the demands of the environment. The core skills your brain uses to think, read, learn, remember, reason, and pay attention. Our team creates technologies that are easy to use and are built to improve circles of care for children with disabilities. We are clinicians, educators, researchers, software developers, and parents. We deeply care about issues such as early intervention, collaboration, and innovation as a way to make a meaningful positive impact worldwide. Teleroo™ is the collective name for our exclusive suite of proprietary, patent-pending technology and therapy tools. Teleroo™ is the result of more than 10 years of research and development, and the collective expertise and experience of our team of therapists, practitioners, researchers, software developers, and most importantly, our families. Teleroo™ was inspired by our collective passion and desire to make a meaningful difference in the lives of children, families, and communities. Teleroo™ gives families, educators, and clinicians access to the professional supports and information they need to be effective in their homes, communities, and workplaces. We employ a high-touch approach that allows us to challenge the conventional limits of service delivery such as proximity, time, and fiscal constraints. For more than 10 years, Kids Uncomplicated has provided high-quality clinical and family support services for children and families with complex needs (e.g., autism, FASD, Down Syndrome etc) – delivered by our dedicated and highly experienced team of specialists. We collaborate with families to build their capacity and support their children in various areas of development. 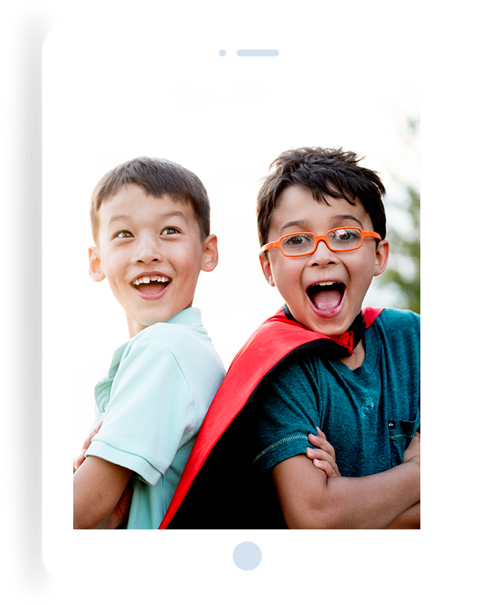 Congratulations to Kids Uncomplicated on the launch of your new Teleroo™ Technology." The added support (from the technology) has made a big difference." A lot of times with clinical work, you’d be traveling out and maybe there’d be a month between consultations. Now you don’t need that."